How was your weekend?! Mine was actually quite relaxing and I was able to mentally and physically prepare myself for this week, which makes all the difference to the overall tone for my weeks. If I don't have a weekend that allows me to fully recharge, everything is off kilter. Now let's get into today's outfit. 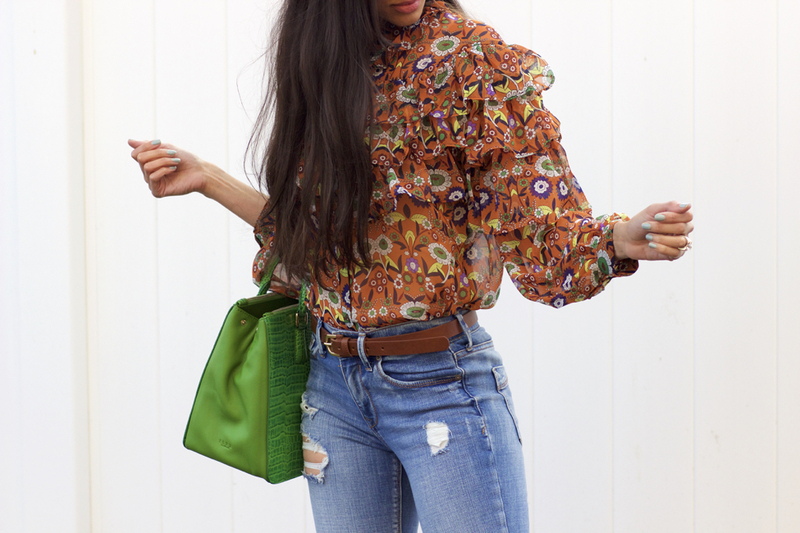 I've decided to restyle this gorgeous blouse I first wore on the blog towards the end of fall (see here). In that post, I added rich, saturated shades of burgundy to enhance the seasonal vibe. This time around, I've added pops of green, which I've already mentioned is the color I'm loving most this spring season in this post. The lighter color brightens the overall look and changes the mood entirely. 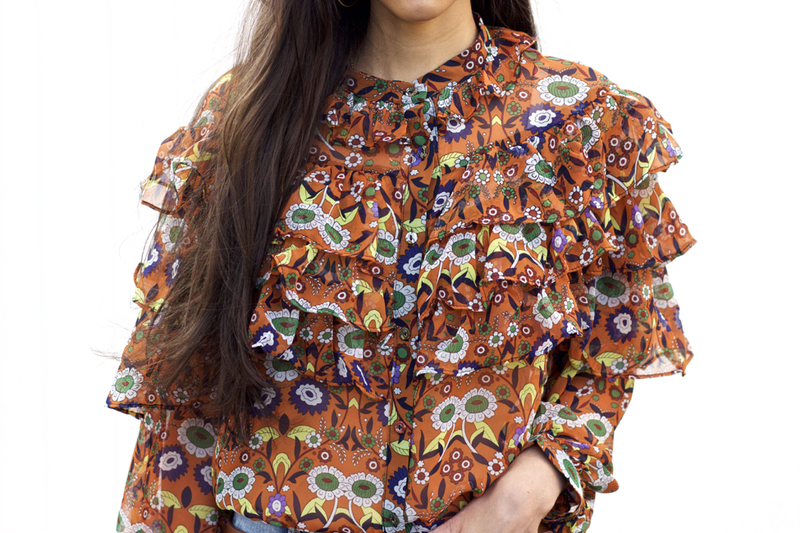 This is what I love most about printed pieces that feature various colors, it allows for you to pull out any of the colors already found in the top, which can help to change the tone and overall feel of your outfit. The ditsy florals have a more playful mood, typical of the '70s, as opposed to some other trending florals, such as roses, that tend to lend themselves to a more passionate and romantic vibe. Though the print has a very '70s vibe, the high neck and ruffles are symbolic of the Victorian Era, which makes it all the more unique and beautiful. 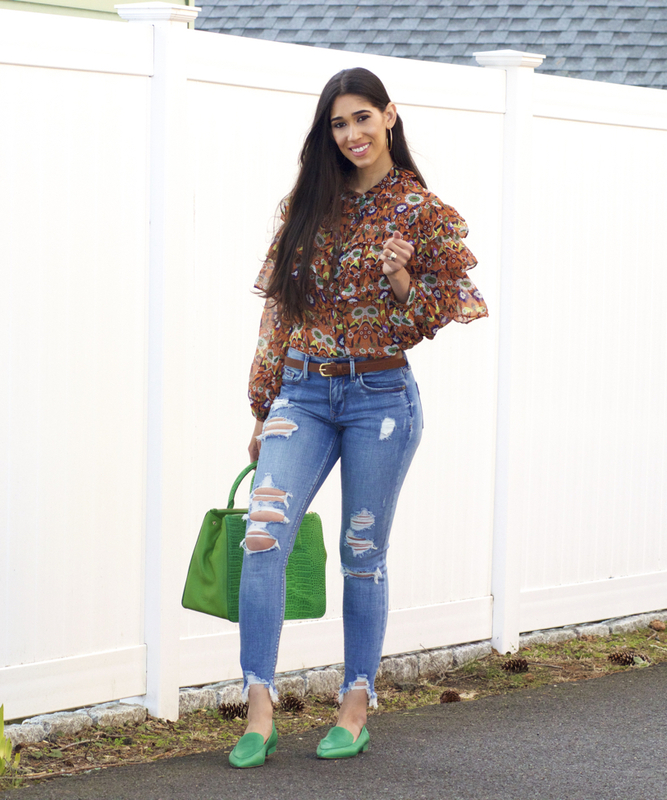 Since both details create a vintage look to the blouse, I wanted to somehow incorporate a modern touch, which is why I opted for the distressed skinny jeans. You've probably seen these jeans all over social media and fashion blogs because they're quite popular. I finally decided to get a pair myself and I'm so glad I did because I absolutely love them! The fit is so good (true to size) and I love the placement of the distressed details, including the frayed hems. I highly recommend (they're currently 40% off!). One thing I failed to mention in last week's post on my love for green, is that shades I believe to be the most universally flattering are kelly and emerald greens. Emerald is typically worn during the fall and winter months, but there are ways you can style it to make it more suitable for spring, like with yellow (as seen in this post). I hope you found some inspiration from today's outfit and I hope you have a wonderful week ahead, my friends!